"In the last episode of Soap, Billy decided to leave the Sunnies, only Reverend Sun decided he couldn't and is keeping him against his will. Burt decided to find out if he really saw a spaceship, which might have been a bad decision, because he saw another one and then vanished into thin air. And then Jessica told Chester and Donahue she made a decision, only she didn't tell them which one she decided on. Confused? 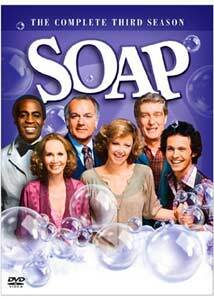 You won't be if you decide to watch this episode of Soap." Of necessity, this review will include spoilers for the first two seasons of the series. Read at your own peril. In 1977 the series Soap stormed onto the scene with enormous controversy as it brought sexual themes, treated in a highly comic manner, into prime time television. Though the series would only run four years, this witty and sharp satire of daytime soaps is fondly remembered by the many who saw it during its original run. This third season chronicling two daffy families in Dunn's River, Connecticut, is the last of the really good ones, with creator Susan Harris still writing most of the scripts; in the fourth season that would change and the creative focus would become sharply diluted. But here in the third year it's still both barbedly funny and often moving with surprising frequency. When we left the cliffhanger ending of Season Two, Burt Campbell (Richard Mulligan) had been captured by aliens, Jessica Tate (Katherine Helmond) was making a choice between her philandering husband Chester (Robert Mandan) and Detective George Donahue (comic John Byner), whom she had hired to find Chester when he was lost and suffering from amnesia. Jessica and Chester's son Billy (Jimmy Baio) had been seized by the Sunnie cult, daughter Eunice (Jennifer Salt) was in love with convicted murderer Dutch Leitner (Donnelly Rhodes), and daughter Corinne (Diana Canova)'s marriage to former priest Tim Flotsky (Sal Viscuso) was crumbling in the wake of the demonic possession of their baby. After Burt is replaced by an alien who looks just like him, Burt's wife Mary (Cathryn Damon) doesn't know the difference and ends up pregnant, but by whom? Also in the mix are Burt's ventriloquist son Chuck and his dummy Bob (Jay Johnson), Mary's gay son Jodie (Billy Crystal), whose baby was stolen by his former girlfriend, and her other son Danny (Ted Wass), mourning the murder of his wife by kidnappers. Things eventually sort themselves out, but of course new complications set in as Billy gets involved romantically with his high school teacher, Leslie Walker (Marla Pennington), Burt learns he's doomed to die and decides to get in the Guinness Book of World Records, Danny gets involved in an interracial relationship with Polly Dawson (Lynne Moody), and Jodie's baby is first abandoned on his doorstep and then its mother, Carol David (Rebecca Balding) returns to demand custody. And through it all, the Major (Arthur Peterson) continues to fight World War II. There's a lot going on here, and Harris apparently recognized that the size of the cast was becoming too unwieldy for a weekly series. Characters are mercilessly trimmed from the story, and the butler, Benson (Robert Guillaume), who was the only sane person in the Tate household, leaves early in the season to star in his self-titled spinoff series. He does get some very good moments in his few episodes, with his trademark snappishness tugged at a bit to reveal him as a sentimental softie towards at least some members of the household. He's replaced towards the end of the season by Saunders (Roscoe Lee Browne), who seems a weak imitation of the original, though Browne is always worth watching. The storylines, which at the end of the second season had veered into horror and sci-fi territory, come back to earth by midseason, returning to the more prosaic soap opera storylines of murder, betrayal, infidelity, and romance. But there's an overarching plea for tolerance running through this season. Even though that had been present to some degree from the start in the sympathetic portrayal of Jodie, the first openly out gay character in prime time, it's racheted up to a new level here as the court battles reflect the intolerance in society and the court system for single gay parenthood. At the same time, the difficult relationship of Danny and Polly demands acceptance too, as they just try to make a peaceful and loving life for themselves as racists around them hurl stones through their window and set their home on fire. Granted, none of this sounds very funny, but that's the genius of the series. There's hardly a clunker of a storyline in the season, and the often disastrous occurences are played broadly for laughs. It helps greatly that there's a first-rate cast here, with Helmond in particular memorable as the impossibly ditzy Jessica. Richard Mulligan gives the twitchy Burt a great depth here, vascillating in one short scene from being a comic buffoon to a poignant and heart-rending man who's been told he has only months to live. The supporting cast is excellent, with Chuck and Bob and the Major reliably providing humor whenever they show up. This series is still great fun, and surprisingly holds up quite well over 25 years later, despite a couple of disco jokes. The controversy seems a little silly now, and nothing on the program seems all that shocking (and the schoolteacher story could practically be ripped from today's headlines). The performances and characters make this a worthy addition to a collection of television comedy. Image Transfer Review: Unfortunately, this series was shot on videotape, limiting the quality of the picture, which is quite soft. However, color is excellent and there is little in the way of video artifacting other than the inherent softness of the medium. It looks quite nice, given its limitations. The black levels are surprisingly good, although reds are occasionally oversaturated. Audio Transfer Review: The 2.0 mono is a shade muffled-sounding, and the laugh track sounds a bit forward. Hiss and noise are quite limited, raising the possibility of excessive filtering having been applied to the audio. It's tolerable for 1979 television, but nothing special. Extras Review: There are no extras whatsoever, unless you count ads for other television DVDs. Columbia does provide a "Play All" option on each of the three discs. The third season (21 half-hour episodes, and a one-hour season finale with seven separate cliffhangers) is nearly as much fun as the first two, despite the departure of Benson. The DVD set looks and sounds as good as the videotape masters can permit, but there are zero extras this time out.